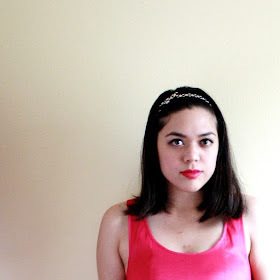 It's been a while since my last good 'ol outfit post--this one's from a month ago (eep!). I've been trying to organize my life lately, and it's been hard. I'm helping out with planning Retail Camp at my alma mater, while attending as many events as I can (which isn't many at all) and working. Good news though: I've been enjoying my new job at the bridal salon. I like it a LOT better than my old job (yay!). Plus, it's kind of fun being surrounded by lots of pretty white dresses (even if they are really heavy). Hope you're all enjoying spring so far!